With the increasing warm weather and abundant fresh fruit arriving at our local farmers’ markets, now is the time to start baking some of our favorite seasonal treats! Paragary Bakery’s Pastry Chef, Laurel Melchor-Sanders, has put together a delicious hand pie recipe that reminds us of the fruit pies our moms made for summer picnics and parties. The recipe blends tart blueberry compote with a rich cream cheese filling, wrapped up in a flaky pastry crust. Enjoy! Whisk together flour, sugar and salt in a medium bowl. Using a pastry blender or just your fingertips, work the butter into the flour mixture until the largest pieces are the size of small peas. Gently stir in ¾ cup of buttermilk, working the dough with a spatula until it forms a shaggy mass that’s mostly sticking together. Using your hands, knead the dough—turning and folding—until it comes together. If there are still dry bits, add the remaining ¼ cup of buttermilk, 1 tablespoon at a time, until it comes together. Once it is all combined (but you can still see chunks of butter in the dough), knead it a couple more times and then divide the dough in half. Shape each half into a square, wrap well with plastic wrap and chill for at least 1-2 hours. Dough can be held in the refrigerator for up to 2 days or in the freezer (double-wrapped) for 2 months. In a medium saucepan, combine blueberries and sugar. Bring up to a low simmer over medium heat, stirring to be sure that it doesn’t scorch. While the berries are heating up, whisk together the cornstarch and water in a small bowl until it forms a ‘slurry’ or thin paste. There shouldn’t be any chunks. Slowly pour the slurry into the simmering berries while you gently stir. You should be able to see the mixture begin to thicken pretty quickly. Continue cooking over medium heat for 2 minutes, stirring constantly. Once the compote is thickened, remove from the heat and chill to completely cool. The compote can be made up to two days ahead. In a mixer fitted with the paddle attachment (or by hand if you have strong arms! ), cream together the cream cheese and sugar. When it’s well combined, add the egg and mix to combine. Set aside. Preheat oven to 375°. Line several sheet pans with pieces of parchment. Removing one round of dough from the refrigerator at a time, roll into a large rectangle about ⅛th inch thick. Cut the dough into 3-inch squares using a sharp knife or a pizza cutter. If the dough begins to be too squishy and floppy at any point, just put it in the freezer for a few minutes to firm back up and work on the other round of dough. On half of the squares, cut a small X in the center. These are the tops of the pies. 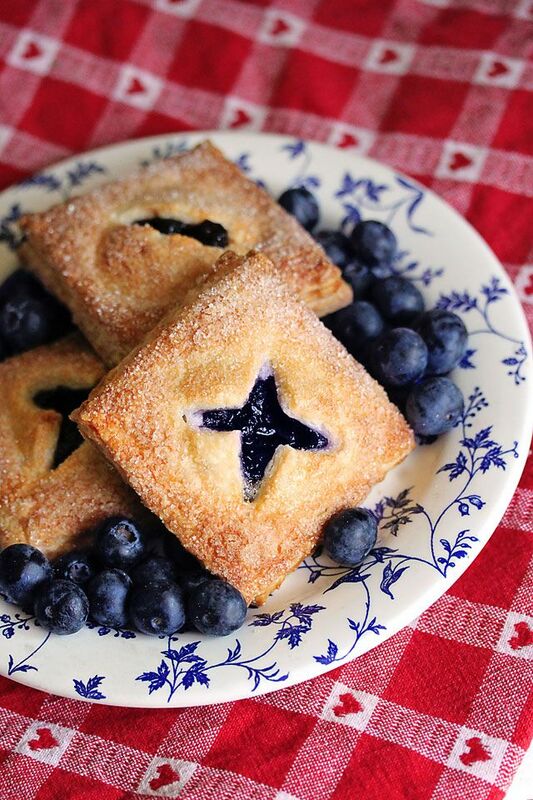 With the other half of the squares, lightly brush with your egg wash and place 1 teaspoon of cream cheese filling and 1 teaspoon of blueberry compote in the very center. Don’t overfill or they will be very challenging to seal properly. Place 2 inches apart on parchment lined sheet pans and bake for 20-25 minutes. The pies will be puffed and deeply golden brown around the edges. Transfer to a cooling rack and cool to room temperature (if you can stand to wait! ).